Chapter Seven. A Prejudiced Review of Ancient Parasites and Their Host Echinoderms: CSI Fossil Record or Just an Excuse for Speculation? 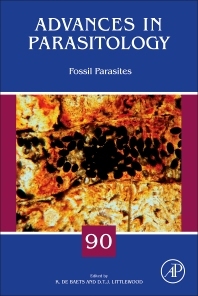 Fossil Parasites, the latest edition in the Advances in Parasitology series established in 1963, contains comprehensive and up-to-date reviews on all areas of interest in contemporary parasitology, including medical studies of parasites of major influence, such as plasmodium falciparum and trypanosomes. The series also contains reviews of more traditional areas, such as zoology, taxonomy, and life history, which help to shape current thinking and applications. Parasitism is a dominant life history strategy and we know it has existed for millions of years. Detecting parasitism in the fossil record is problematic because we rarely see direct evidence and usually must rely on indirect evidence to infer its existence. This unique volume takes a broad and systematic view of direct and indirect evidence for parasitism in the fossil record. Parasitologists, palaeontologists, ecologists, archaeologists, epidemiologists, evolutionary biologists and general biologists with an interest in the history of parasites and their intimate relationships with their hosts through time will find this thematic review invaluable. D. Timothy J. Littlewood is a Merit Researcher and currently Head of Life Sciences Department at the Natural History Museum, London. His main research interests include the systematics of platyhelminths (flatworms), and other phyla, particularly with a view to revealing patterns of diversity and diversification associated with parasitism. Natural History Museum, London, U.K.
Kenneth De Baets is a paleobiologist. He has a MSc. degree in Geology from Ghent University and a PhD in Evolutionary Biology from the University of Zürich. He currently has a teaching position at the University of Erlangen-Nuremberg. His main research focuses on macroevolution, particularly on the relative contributions of biotic interactions (e.g., parasitism) and abiotic factors (e.g., climate) in driving these large-scale patterns. Invertebrates, particularly molluscs and parasitic flatworms, are his main research subjects for these purposes. The evolution of parasitism across the metazoan tree of life is currently one of his main research focuses.